Good afternoon. 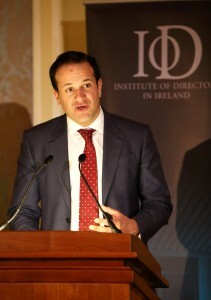 I want to thank the Institute of Directors for inviting me to speak at your spring lunch. The theme I want to speak to you about today is that of political progress and stability. Ireland has gone through a very tough period and people have made enormous sacrifices to get us to where we are today. Many decisions made by this Government have been tough on people. But because of your sacrifices, the future for Ireland is bright once more. We can see it all around us: more people at work, incomes rising again in some sectors, more cars and trucks on the roads, and home values recovering. Of course, the job is not yet done. We need to sustain and build on our economic recovery to make it real for more people, by putting more money in their pockets, and investing again in infrastructure and public services like health, education and children. That’s why this Government has taken 410,000 workers out of the Universal Social charge. We plan to increase this to 500,000 in the next Budget. That would represent more than 25% of the workforce. That’s why this Government has lowered USC rates for all other low-income workers. That’s why we took 1% off the top rate of tax in 2015. And that’s why we plan to create 40,000 more jobs this year and reduce the unemployment rate to under 10%. • Improving patient outcomes and safety, by reducing delayed discharges, relieving pressure on EDs, reducing trolley waits, and implementing a plan for waiting lists, with a focus on very long waiters. • Helping people to take responsibility for their own health, by bringing in new laws to tackle cheap alcohol and binge drinking, requiring calorie counts on menus, and obtaining new data on the nation’s health. • Taking the first concrete steps to provide a Universal Health service by extending GP services without fees to all under sixes and over 70s. • Modernising health infrastructure by starting construction work on the new Children’s Hospital, submitting planning permission for the new National Maternity Hospital, and building nine new primary care centres. 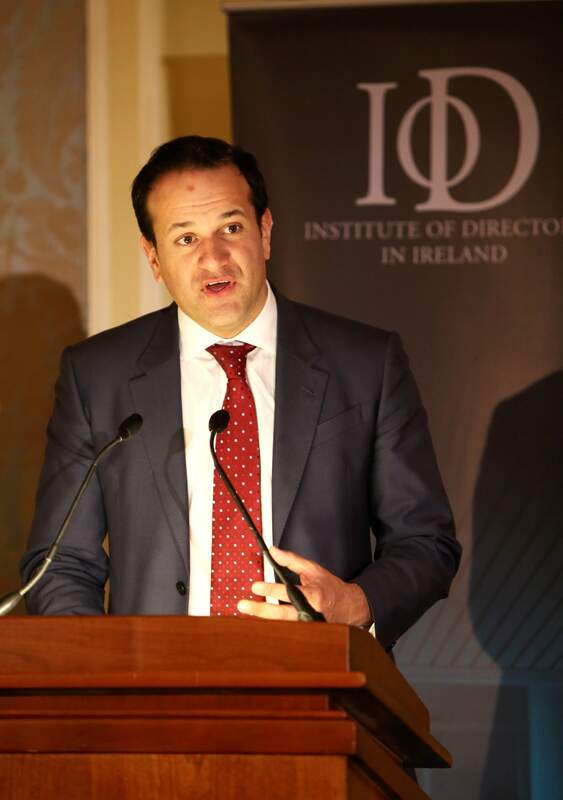 • And reforming the health service, by getting the hospital groups and community healthcare organisations up and running, and increasing investment in ICT and eHealth. The election next year will be one of the most important ones in the history of this State. Some are predicting greater political instability, and are fearful about what this might mean – governments always on the brink of collapse, strikes, demonstrations and unrest, and political institutions unable to support the needs of business, investors, or the people. Many are worried about what the opinion polls are suggesting – that we will have a fragmentation of the party system, a rise of independents – and groupings of independents – and that we risk returning to the early 1980s when we had 3 elections within 18 months. This lunchtime I want to offer a message of hope, rather than of fear, because despite everything that is going on there are reasons for optimism. In part, because of the strong political culture of this country. In part, because of the failings of those who threaten to bring the greatest instability. Countries which go through periods of political instability have a number of things in common. There is usually an uncompromising mind-set among the populist parties, which can work well for them in elections, but which proves fatal when they attempt to work with other parties or to govern. The anti-establishment nature of these parties – and many of our new independent groupings fall into this category – brings about an end of compromise, and that allows for coalitions of extremes to come to power. We can look to some other countries in Europe for examples, including countries which have experienced a similar political fragmentation, and observe the effects of political instability. The Czech Republic since 2003 has had eight different prime ministers and ten different governments, and this instability and uncertainty has given rise to increased corruption and state bureaucracy as a result of the weaknesses and inefficiencies produced. Latvia also had ten different coalitions, and six different prime ministers in the same period, with every government torn apart by internal conflicts and interest groups. Or take Italy, which is famous for its coalitions, its ever-changing political landscape, and above all, its political unpredictability. Italy famously had 50 governments in its first 50 years of democracy, and has had 61 different governments in total since World War II. Last time around, a party led by a former clown gained 24% of the vote. Belgium has had six prime ministers and seven governments since 2003. In 2011 the country entered the record books because it went for 589 days without an elected government, and it took 541 days of negotiations before a six-party coalition was formed. The previous record was held by war-torn Iraq. During those 589 days in Belgium no major budget decisions could be made, there were fears of a debt crisis, the markets were nervous throughout, and the credit rating was downgraded. The country endured, however, and remarkably, day-to-day life continued as before. I do not predict a similar thing happening in Ireland in 2016. We have always been good at forming coalitions to represent the wishes of the electorate, interpreting the results of elections, and doing it quickly. The turmoil of the early 1980s was an exception, not the norm. At the time of our greatest crisis in 2011, the people voted in a coherent government. I remain hopeful but not complacent that they will do so again. We should be grateful that we have one of the most stable political cultures in the world. Ireland is sometimes described by political scientists as a ‘first wave democracy’, one of the countries that gained its independence in the 19th or early 20th centuries and established a parliamentary democracy. But Ireland had a parliamentary democracy tradition going back centuries, first with its own parliament, and then in the British parliament. Our political culture was immeasurably strengthened by the experiences of Grattan, O’Connell, Parnell, and countless others. At its highpoint in 1922, during the first wave of modern democracy, there were just 29 democracies in the world. Many of these succumbed to dictatorship in the 1920s and 1930s, or were taken over and occupied during the Second World War. It is estimated that in 1942 there were only 11 or 12 parliamentary democracies left in the world. Ireland was one of them. Indeed, Ireland is the 4th longest continuous democracy in Europe. Thankfully, the world has moved very fast in our lifetime, and today there are an estimated 117 global democracies. Ireland has a strong political culture going back centuries, and it kept us free during the times in the twentieth century when other countries looked for easy solutions and easy ways out. So there are reasons to be confident about Ireland in the 21st century, no matter what the next election throws up. What we need to be worried about is not the results of the election, but what happens next. It is the instability of the political visions being presented that is the real danger, because this is what offers the greatest threat to our economic recovery and to our political security. It is not so much about what Sinn Féin will do in power on their own – even though their policies would be economically disastrous for this country. We all know they will never secure an overall majority, or anything near it. But we should be worried about what kind of coalition of extremes would be formed afterwards: between Sinn Féin, right and left-wing independents, those on the far left, and possibly even some dissident Fianna Fáilers. Instead of producing a programme for government which would provide stability for five years, we would get a programme for self-interest, with policies being traded for votes, and national interest sacrificed for local and selfish concerns. Among the opposition we currently have one party – Sinn Fein – with a flawed vision, one party – Fianna Fail – with no vision, and a smattering of independents who are just seeing visions – visions of ministerial office for themselves, and easy solutions for the country. The most likely alternative to a Fine Gael-led government is a Sinn Fein-led government. So let’s see how things might look under such a coalition. The Economist Intelligence Unit – the EIU – has established some specific questions to analyse political instability in a country. Its analysts assess the status of a country on a quarterly basis. In the most recent rankings Ireland had a score of 1 out 5 in the political instability category. This is the lowest possible rating, meaning we are seen as one of the most stable polities. Interestingly enough, overall Ireland scored 13th in the world in terms of all the factors it examines: health, education, security, political culture and so on. It is hard to see how business operating conditions could do anything but deteriorate under a political party which says it wants to raise an additional €1.8 billion ero in new taxes, and create a new tax band so that anyone earning over €100,000 a year would have to pay an additional 7% in tax, making it a massive 59%. They want to abolish the property tax, but make up for the loss of income by introducing a 1% wealth tax on assets valued at over €1 million, and increase both Capital Gains and Capital Acquisitions taxes by 10%. They want businesses to pay for domestic water charges. It is a recipe for political disaster, never mind wrecking the fragile economic recovery we have all worked so hard to secure. Commentators like to criticise this government for its use of the whip system, but imagine what it would look like under a party where no one disagrees with the master, and where a strict policy of loyalty to the leader is enforced no matter how great the scandal, or how big the crime. Both parties in this coalition have lost TDs over the past three years. That’s regrettable in one way, but a reaffirmation of the democratic principle in another. This would never happen with Sinn Féin. Its members swear blind allegiance, and have made worship of the party line their religion. There would be no independent thinking in a Sinn Féin-led government, and not even Groupthink. There would just be One Thought, One Rule. And that would be the rule of fear. There is no party whip, just party chains. Following the Fine Gael national conference last Saturday I went into Castlebar town and meet casually with some of the protesters. That’s the constitutional way – to have a robust debate on the issues. It was unthinking adherence to outdated and incorrect ideologies which almost ruined this country. We do not need a party in power which still thinks such unthinking loyalty is a good thing. Whatever about international tensions with our closest neighbour if Sinn Fein was in power, I shudder to think about a Sinn Fein foreign policy that would alienate allies, terrify foreign investors, and close off the very markets we have done so much to open. Their rigid ideology is all well and good on the back benches, where it can be dismissed, answered or ignored, but not on the world stage. We should look to Greece for a glimpse of our possible future. Sinn Fein’s and the Far Left’s approach is to do what Syriza promised: stand up to Europe, and get a better deal. Syriza promised an overhaul of the bailout and its onerous austerity terms, debt write-off, and no more co-operation with creditors or the Troika. Last week they even announced a ‘decisive step’, insisting they were ‘leaving austerity, the bailouts and the troika’. But what did that mean in reality? It meant a four month extension of the bailout, now renamed ‘an agreement’, a deal with the creditors, now renamed as ‘partners’, and an end to the Troika, because they are now referred to as ‘the three institutions’. Or, if you prefer, the institutions formerly known as the Troika. But we should remember that line from Virgil: ‘Timeo Danaos et dona ferentes’. Or as it is known better in English: ‘Beware of Greeks bearing gifts’. Rather than offering a solution, the Greek example just offers us a change of names. 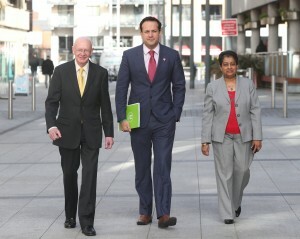 This Government addressed these challenges honestly and were open with the Irish people. It was tough work, but it was the only honourable way to do it. Illusions can be powerful things, but it is time for us to see through them. Everybody has a role to play, in ensuring that the choice before the people in 2016 is clearly understood and appreciated. There’s no point decrying the outcome once the votes have already been cast. The next election may well lead to political instability, but we should be confident in our political culture to feel that we will be robust enough to withstand any challenges. What we should be more afraid of is unstable political visions. We are being offered illusions of the future which are drawn from lies about the past. And so, we should stay the course. It hasn’t been easy but we are on the right track. We have lost a decade of economic and social progress due to the crash, but we are recovering fast and can regain that ground quite fast. It is a time for hope and optimism but not complacency or risk.